Australian rampage of Anonymous continues, after took down of several Australian Government website & a massive data breach from Australian ISP named AAPT now the nuisance hacker collective group today attempted to hack into both the Australian Security Intelligence Organisation (ASIO) and Defence Signals Directorate (DSD) websites. The attack was took place in early Friday, and here also Anon enlisted this cyber attack among their F**k Friday rampage also known as #FFF. The hacker group claimed to have shut down a computer server belonging to Australia's domestic spy agency ASIO, reportedly briefly closing down access to its public webpage. 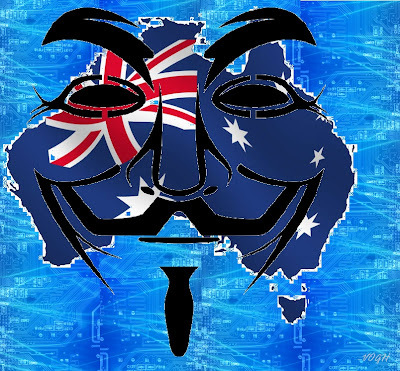 On its Twitter feed Anonymous Australia (@AuAnon) wrote: "The anonymous Operation Australia hackers have today again been busy with further attacks on the ASIO and DSD website." According to sources - ASIO server faced massive traffic generated from a DDoS botnet, which immediately effected the normal service and later when loads get increased then as expected ASIO became passive and gone offline. The Australian Security Intelligence Organisation (ASIO) acknowledged some disruption to its website. "ASIO's public website does not host any classified information and any disruption would not represent a risk to ASIO's business. "- said ASIO spokesman. The Sydney Morning Herald reported that ASIO's website was down for at least 30 minutes Friday morning, but it appeared to be loading normally Friday afternoon. Operation Australia, which has its own @Op_Australia Twitter stream said it would "stop the attacks at 10pm Aus. BUT we will never stop watching! ".